Computes similarity between two objects to be registered. This Class is templated over the type of the fixed and moving images to be compared. This metric computes the sum of squared differences between pixels in the moving image and pixels in the fixed image. The spatial correspondance between both images is established through a Transform. Pixel values are taken from the Moving image. Their positions are mapped to the Fixed image and result in general in non-grid position on it. Values at these non-grid position of the Fixed image are interpolated using a user-selected Interpolator. Definition at line 52 of file itkMeanSquaresImageToImageMetric.h. Definition at line 40 of file itkOptMeanSquaresImageToImageMetric.h. Definition at line 62 of file itkMeanSquaresImageToImageMetric.h. Definition at line 62 of file itkOptMeanSquaresImageToImageMetric.h. Definition at line 54 of file itkOptMeanSquaresImageToImageMetric.h. Definition at line 83 of file itkMeanSquaresImageToImageMetric.h. Definition at line 59 of file itkOptMeanSquaresImageToImageMetric.h. Definition at line 86 of file itkMeanSquaresImageToImageMetric.h. Definition at line 70 of file itkOptMeanSquaresImageToImageMetric.h. 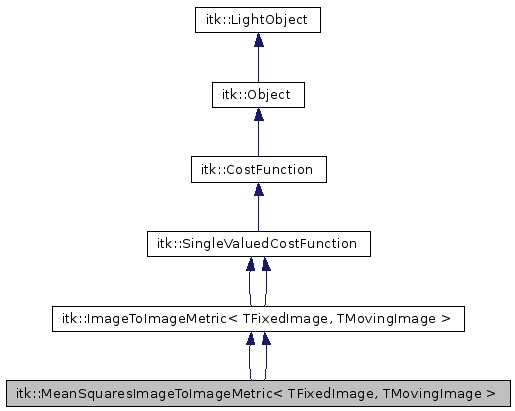 Definition at line 64 of file itkOptMeanSquaresImageToImageMetric.h. Definition at line 56 of file itkOptMeanSquaresImageToImageMetric.h. Definition at line 84 of file itkMeanSquaresImageToImageMetric.h. Definition at line 78 of file itkMeanSquaresImageToImageMetric.h. Definition at line 77 of file itkMeanSquaresImageToImageMetric.h. Definition at line 65 of file itkOptMeanSquaresImageToImageMetric.h. Definition at line 67 of file itkOptMeanSquaresImageToImageMetric.h. Definition at line 79 of file itkMeanSquaresImageToImageMetric.h. Definition at line 52 of file itkOptMeanSquaresImageToImageMetric.h. Definition at line 53 of file itkOptMeanSquaresImageToImageMetric.h. Definition at line 82 of file itkMeanSquaresImageToImageMetric.h. Definition at line 60 of file itkOptMeanSquaresImageToImageMetric.h. Definition at line 87 of file itkMeanSquaresImageToImageMetric.h. Definition at line 58 of file itkOptMeanSquaresImageToImageMetric.h. Definition at line 57 of file itkOptMeanSquaresImageToImageMetric.h. Definition at line 85 of file itkMeanSquaresImageToImageMetric.h. Definition at line 80 of file itkMeanSquaresImageToImageMetric.h. Definition at line 55 of file itkOptMeanSquaresImageToImageMetric.h. Definition at line 39 of file itkOptMeanSquaresImageToImageMetric.h. Definition at line 61 of file itkMeanSquaresImageToImageMetric.h. Definition at line 68 of file itkMeanSquaresImageToImageMetric.h. Definition at line 37 of file itkOptMeanSquaresImageToImageMetric.h. Definition at line 58 of file itkMeanSquaresImageToImageMetric.h. Definition at line 38 of file itkOptMeanSquaresImageToImageMetric.h. Definition at line 59 of file itkMeanSquaresImageToImageMetric.h. Definition at line 51 of file itkOptMeanSquaresImageToImageMetric.h. Definition at line 76 of file itkMeanSquaresImageToImageMetric.h. Definition at line 75 of file itkMeanSquaresImageToImageMetric.h. Definition at line 50 of file itkOptMeanSquaresImageToImageMetric.h. Definition at line 74 of file itkMeanSquaresImageToImageMetric.h. Definition at line 46 of file itkOptMeanSquaresImageToImageMetric.h. Definition at line 73 of file itkMeanSquaresImageToImageMetric.h. Definition at line 66 of file itkOptMeanSquaresImageToImageMetric.h. Definition at line 118 of file itkMeanSquaresImageToImageMetric.h. Get the value and derivatives for single valued optimizers. Initialize the Metric by (1) making sure that all the components are present and plugged together correctly, (2) uniformly select NumberOfSpatialSamples within the FixedImageRegion, and (3) allocate memory for pdf data structures.